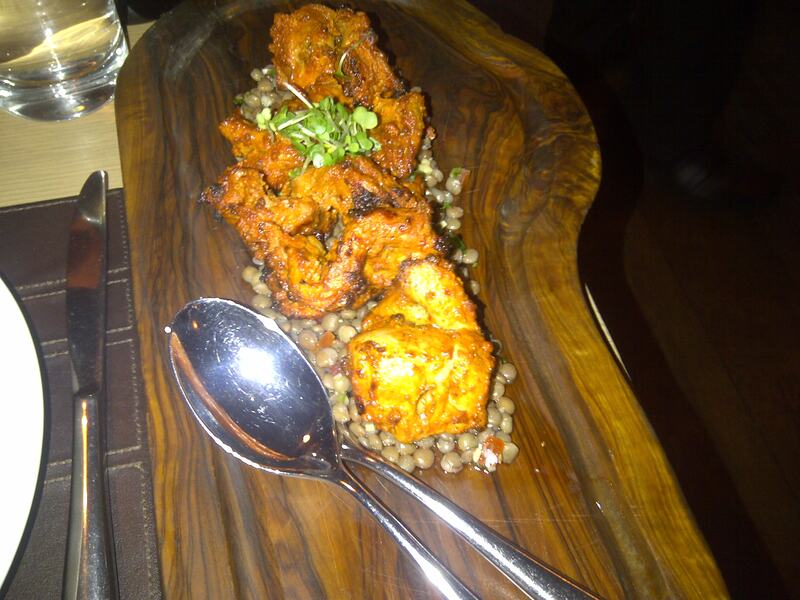 Trishna is a Michelin-starred Indian in Marylebone, a five minute walk from Oxford Street. The decor is Scandanavian minimalist with Indian twists, along with some random British pictures (including the classic shot of Vinny Jones grabbing Gazza by the privates). They have about 10 tables and can bring out a few more outside if the weather is nice. There is good value to be found here, especially the 4 course pre-theatre menu for £25; the 5 course tasting is £40 and the 7 course £55. The menu includes wine pairing suggestions if you prefer something more sophisticated than a bottle of Cobra with your curry and they have an interesting and carefully chosen wine list. I was a bit skeptical about wine with curry but the Austrian Zweigelt we had complemented the food perfectly – it was robust with a slight sweetness that cut through the spiciness of the food. 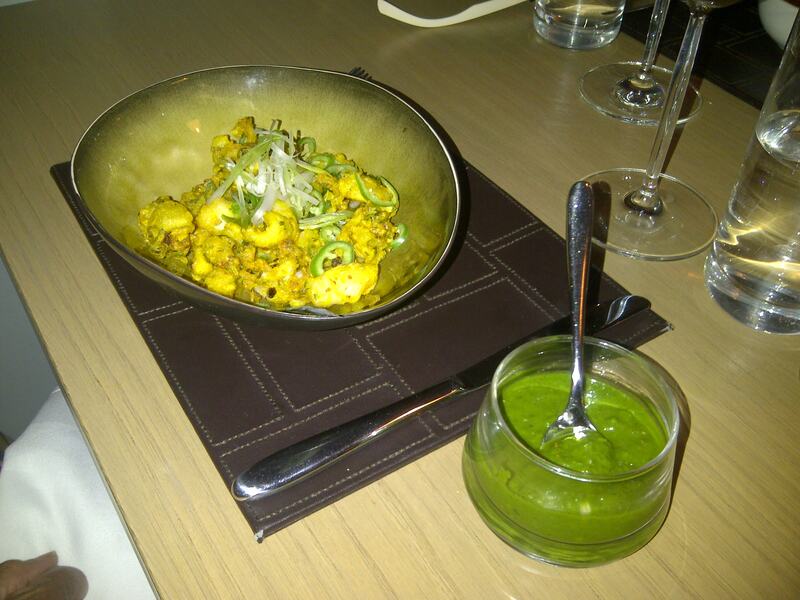 To start, I sampled lobster and crab salad (£9.5) which was light and fresh, with tangy pea chutney and wonderfully sweet mini cauliflower pakora. Fried shrimp with carom seed and ginger (£9.75) wasn’t very exciting but had a nice balance to its spicing. The main course choices concentrate on seafood with a brown crab dish looking the most interesting, but also the most expensive at £22.5. I opted for guinea fowl tikka (£15) for its novelty value and was extremely impressed – the meat was gamey, almost nutty and melt in the mouth succulent, with a wonderful tandoori hue. It was the highlight of the meal for me. All of the accompaniments were up to scratch with nicely cooked rice and light (not doughy) nan breads. I am not too keen on Indian desserts so I didn’t order anything for myself, but I had a small taste of my girlfriend’s homemade ice cream which was very good. Verdict: well worth a visit, but go for the pre-theatre (4 courses for £25). Also see: edgeandspoon and fttw. Worth its Michelin star, do you think? Yes I would say so – and far more deserving than Quilon.